Auburn University’s College of Education is engaged in an innovative student exchange program with Universidad Nacional (UNA) in Costa Rica. For two weeks in January, four Master’s level students working on English as a Second Language (ESL) degrees at UNA came to Auburn for a Professional Development/Internship experience in modern language education. These students have an interest in teaching and curriculum development as well as L2 research. Curriculum and Teaching Associate Professor Sue Barry directs the program. “This exchange requires us to find host families for the students, organize observation programs in K-16 settings in Auburn, Birmingham, and Atlanta, schedule excursions to local points of interest, and accompany the students on these trips,” Barry explained. Auburn students receive the same basic opportunities when they study for two weeks in Heredia, Costa Rica, in the summer. Barry said the program has had a great participation rate over the years. 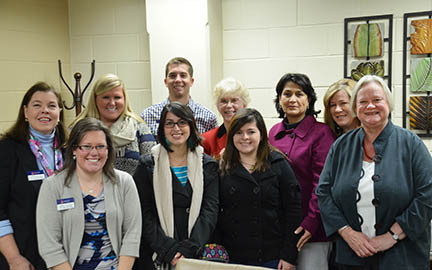 Costa Rican visitors to Auburn were photographed last week, being welcomed to Auburn by Dean Betty Lou Whitford. These visitors include Hilda María Fonseca Solórzano, Cristel Melissa Hernández Chavarría, and Karla Fabiola Fonseca Benavides.